The card for Battleground is stacked. Battleground comes to us this Sunday from the Scottrade Center in St. Louis. It has the potential to be one of the best July events WWE has ever produced because I think the card is stacked. We have The Beast, Brock Lesnar, Seth Rollins, John Cena, Kevin Owens, Roman Reigns and Bray Wyatt all in prominent matches, and that means nothing but good things for the fans. Unfortunately, the Intercontinental Championship won’t be on the line. More on that later. I don’t think I could care less about this match. Barrett is a joke and so is R-Truth. And not in good ways. They’re apparently feuding, and nobody cares. It’s terrible and I hope this lasts less than one minute. Your winner: King Barrett. Even though he always loses. Always. These two teams have a great rapport with each other in the ring, so I really don’t care who wins this match. Both teams are entertaining and both deserve runs with the Tag Team titles. I wouldn’t even mind seeing a title change here and another one the next night on Raw. If WWE would book both of these teams more than just one segment on television on each show, they could seriously increase quarter ratings. Their matches on television and at live events make me hope the end to this feud is not near. I would like to see a title change, but I’ll go with the champions to retain. I was originally going to pick Ryback to retain his Intercontinental Championship in a Triple Threat Match against Big Show and The Miz. Unfortunately, Ryback sent out these Tweets on Wednesday, saying he would be unable to compete at Battleground due to a staph infection that has landed him in the hospital for the foreseeable future. Intercontinental Championship this Sunday. I am sorry to all my fans and the WWE. I will be back shortly, but I have to get this corrected. As of this writing, WWE hasn’t announced whether Big Show and The Miz would wrestle in a No. 1 Contender’s Match, but I think that’s a logical next step. If that happens, look for Show to come out on top. If not, forget this paragraph. Orton returned to Raw a few weeks ago and set his sights on Sheamus, giving us a feud that makes sense, but hasn’t been impressive. Orton’s the face, Sheamus is the heel, but nothing really has happened to make me care about this match. I think this’ll be a good match, and I think Sheamus needs a win more than Orton due to his Money in the Bank briefcase, so look for the Celtic Warrior to come out on top. This match has seen some interesting build the last few weeks, with Wyatt being one step ahead of Reigns most of the time. I’d like to see Wyatt gain the victory here, and the only way I can see that happening is if Reigns’ daughter actually makes an appearance. On the live event circuit, Reigns has come out on top pretty much every time the two have faced each other, but that’s probably due to the nature of the event not being televised and trying to make the fans in attendance happy. Wyatt’s last special event win was back in May against Ryback at Payback. He’s won two times on television since that match. He needs a win. Reigns has looked strong since WrestleMania, but I think the buzzards are walking out of Battleground with a win. This is probably the match I’m looking forward to the most based on the two previous matches the two have engaged in at Elimination Chamber and Money in the Bank, respectively. To go along with that, the match the two had on Friday night at the Wells Fargo Center was another classic. Sure, we see some of the same moves, but the story of the match changes each time, and that’s what I’m most interested in. Will we see Cena suffer some sort of “injury” early on in the match to make him look strong even in defeat? Will Owens escape with a quick win out of nowhere to make it appear like a fluke? Will the match end in a disqualification, setting up the real rubber match for Summerslam? A lot of questions will be answered Sunday night. Honestly, I wouldn’t mind a DQ finish, allowing the two to settle the score at Summerslam. To me, that’s where the final battle should take place. Then again, it looks like the creative team is throwing Cesaro into the mix, so does he play a role in the match? It’ll be interesting to see, but I’ll go with my early prediction and say there’s a reason why they took the NXT Title off Owens when they did. And I think this is his moment. I’m excited for this match because it looks like Rollins will be alone against Lesnar. Of course, that’s where I think some shenanigans take place and ultimately allow Rollins to retain the championship. I expect Lesnar to dominate like he has in every single match he’s been in for two straight years, but something has to happen. I don’t think Paul Heyman will be turning on Lesnar, although I wouldn’t exactly be surprised if that happened. I can’t see it happening, though. Maybe Triple H gets involved. Maybe The Undertaker. Maybe Sheamus. Who knows? All I know is that I’m not picking the title to change hands. It certainly looks to be a stacked card for a July event, especially with Lesnar appearing. While I don’t think he’ll win the championship back at Battleground, I think there’s a good chance he’ll win it back at Summerslam next month. I could also see WWE not having Lesnar win back the title at all anytime soon, because losing it in quick fashion would make him look weak. I feel like WWE will still give Reigns his time to shine next year, but not at the expense of Lesnar. This will probably be one of the better summer events WWE has given us in recent memory, so I’m all in. 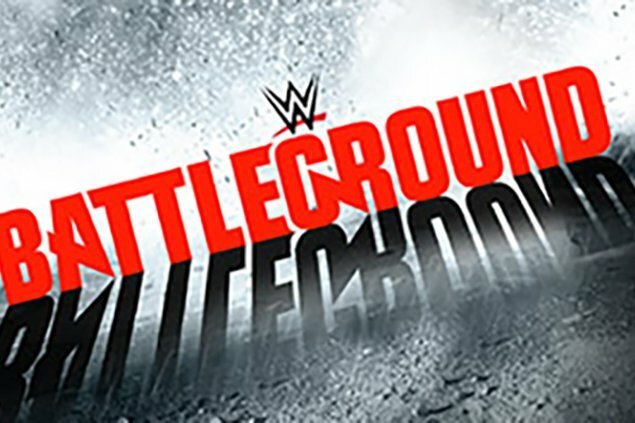 I’m hoping Battleground delivers for us. I’ll have a complete Battleground review right here at The Philly Voice on Monday morning followed by the fallout in my Raw roundup on Tuesday morning.